Pasta is a very common ingredient in my house. We can go without cooking pasta at least every 2 days. And only because I don’t want to eat it everyday. Because if dinner was a boyfriend’s decision, for sure it would be pasta everyday! Heat a saucepan and add the onion and garlic. Fry for 2 min. Place in a bowl. Squeeze the bread dry and crush it up. Add to the bowl of onion and garlic. Add the mince and mix well to combine the ingredients. Wet your hands slightly and shape the mixture into golf balls. Heat a frying pan and add the oil. Gently shallow fry the meatballs. Brown on all sides and set aside. Simmer for 35 min. Then when the sauce has cooled down, with a hand blender, whiz till the consistency of the sauce is smooth. Mix in the stock and the beans. Then add the meat balls and simmer for 25-30 minutes. Place the pasta in individual plates that are oven proof or 1 large oven tray. 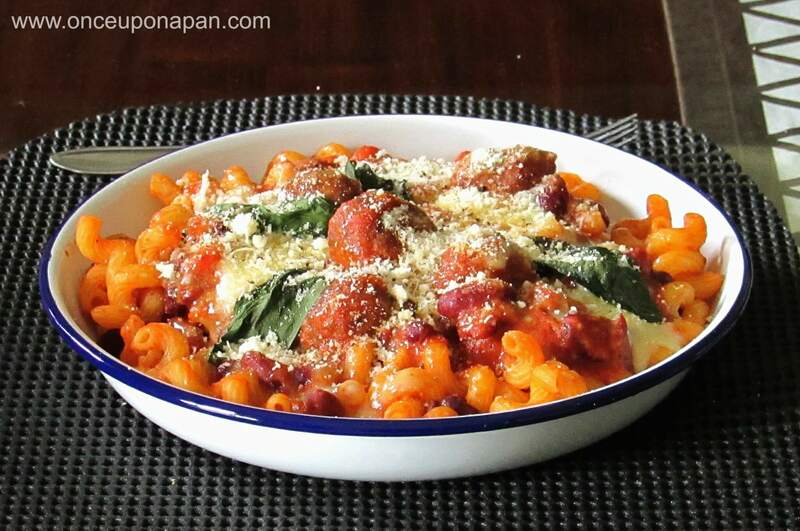 Put the meat balls on top of the pasta and drizzle with the tomato and beans sauce.